The UFO phenomenon has manifested itself on Earth for more than a half-century. Before presenting in a condensed manner the activities of our UFO-Science group, we’d like to start recalling different features of the phenomenon and its impact on our society. The impact has been, it must be said, almost null, at least in the social circles accessible to us. As for the profit that the military of more developed countries have had from it, that’s another story. But let’s get deep into the question of the impact. It’s surprising that a phenomenon that has been supported by a hundred thousand observations, many of which have a great deal of credibility, has not produced whatsoever reaction in the political, scientific, military (at least to the extent we know so far), religious and philosophical spheres. - Why do you want me to be interested in a phenomenon that has no foundations? The lack of serious scientific studies made by competent scientists leaves the subject in the hands of speculators whose only material available is limited to a few witnesses, photographs or videos, all of them subject to doubt. In 1977, France created a service which has had several names in the last thirty years: GEPAN (Groupe d’Etudes des Phénomènes Aérospatiaux Non Identifiés), SEPRA (Service d'Expertise des Phénomène de Rentrées Atmosphériques), and finally, in 2005, GEIPAN (Groupe d'Etude et d'Information sur les Phénomènes Aérospatiaux Non identifiés). This service continues to limit its actions to witness accounts and ground surveys, stating that scientific studies are not part of its mission (after… 33 years !). Neither the military, comparable to the American National Guard, or the service itself (currently limited to two people: an engineer and a secretary) have, and haven’t ever had, the minimal scientific expertise to face these questions, and nothing enables to foresee that things can evolve differently in the future. Why things have evolved like that? The answer is simple. Behind the UFO phenomenon lies the hypothesis, a very disturbing one, of the incursion of visitors from other systems apart from ours. During decades scientists have expressed a geocentric skepticism, preferring instead the hypothesis according to which life could not appear and organize in any place different from Earth. Many astronomers even doubt the existence of planetary systems different from ours. But recent observations have revealed the existence of the so-called exo-planets, whose number exceeds to date (May 2010) four hundred. Those observations correspond to relatively near systems, and even the most reluctant astronomers and astrophysicists convey to admit that the universe must contain a fantastic number -defying imagination- of planets capable of hosting life. Observations suggest that the known universe contains a hundred billion stars, each one composed of hundreds billion stars, in which there would be at least a million planets exhibiting organized life. This unavoidable and progressive certitude has evident religious consequences for all monotheistic religion beliefs that claim to be universal. Even if some scientists, such as Stephen Hawking, to quote only him, end up concluding that an organized life necessarily exists in the universe apart from Earth, they moderate their enthusiasm and add “that such a life could most probably exist in a very primitive stage”, which is fantastically absurd. - Ok, but only if you cancel out any reference to UFO. One could not better express the taboo which strikes this subject, after more than half a century. This is explained by the extremely destabilizing character of the idea of aliens´ visits that would imply an immense scientific and technical superiority. This simple idea breaks our fundamental geo-centrism and questions deeply our current scientific knowledge (according to which such voyages would be physically impossible) and our religious beliefs. Every form of thought isn’t more than an organized system of beliefs. From this point of view, science is structured as a religion. The word religion comes from the Latin word religare, which means to unite. Societies are based on a common vision of things, being them religions, science or belief in the virtues of some social or (and) political and economical system. To question it is like to remove the bases that hold the entire edifice. Unconsciously, human beings are perfectly aware of the danger related to the contact as the most shocking thing ever happened in human history. In the course of it very different civilizations have found themselves brutally in contact, like the pre-columbine populations with the Spaniard conquistadors. Entire social systems have crumbled. We have almost daily today an equivalent phenomenon, as for example with the inhabitants of the Amazon basin, and the corresponding word is ethnocide. A contact between the inhabitants of Earth and beings from another planet encloses a priori a risk of ethnocide. It is because our religious, scientific, politic and military systems perceive unconsciously the amplitude of that risk that these social groups exhibit denying mechanisms having the character of a psycho-socio-immunologic reaction. This should not surprise anyone; on the contrary it is highly predictable. The problem is that this rejection mechanism is widespread within the professionals of science, the only ones who could carry out a fertile research on the subject. In the absence of it, the sole collection of simple testimonies or the accumulation of photographs and films, as has been done by the French service for 33 years, is a perfectly vain and sterile attitude. A very logical and simple way of investigating such signals consists in creating a spectral image of the source with the aid of a diffraction grid. These grids are plastic films with fine stripes (commonly 500 of them per millimeter). When purchased in great quantities, they cost only a few centimes of euro. The problem is that they should be diffused widely for any observer in any circumstance to be capable to face the phenomenon. The UFO-Science association has been offering these diffraction grids. People who address it and send a symbolic contribution to facilitate shipping can receive the object. In two years 3000 grids have been diffused by the association in 17 countries. The implementation is very simple. Observers can place the grid in front of the objective of their photography apparatus or in front of their video cam. The image of the source is then transformed into a succession of colored spots constituting a spectrum, as shown in the following image. At UFO-Science we have considered the possibility of integrating the grid with a self-adhesive cap, similar to those that the Japanese fix on their cameras in order to manipulate images. Professionals in optics and spectroscopy can analyze the spectra. At UFO-Science we have the people with the expertise. Spectral analysis, when revealing substances not present in the atmosphere, would allow excluding, on basis of the observation under question, every attribution of the phenomenon to a meteorological natural cause. When people are witnesses of the UFO phenomenon, the light source can be, when photographed, mixed to other sources that perturb the spectral analysis (like the light of reverberators). When confronted with the phenomenon, the observer would be tempted to zoom. But if he doesn’t have a tripod (pied), the chances are high that he/she would lose the object. It is difficult to imagine that someday a witness will have a numerical apparatus or a camera-scope, a diffraction grid and a tripod. Another approach consists in automating the search for UFO spectra. At UFO-Science we have developed a system named UFOcatch. It is made of two elements. A system with an eye-fish objective allows a complete survey of the sky. The images are sent to a computer memory. The system takes an image each tenth of a second. Pairs of successive images are sent to memory and compared pixel by pixel. It is thus possible to detect whichever source in movement (security cameras are also based on this principle). A filtering system intervenes and can be parameterized at will and eliminate, for example, sources like shooting stars or airplane lights, etc. When the computer system estimates, as a function of its parameterization, that the source deserves to be followed, a motorized “mount” freezes the optical system on this single source. An automatic zooming is then operated. This first optical system records an optical image of the source whilst a second one operates the spectrum registration. The latter is automatically analyzed and compared with a spectrum database. 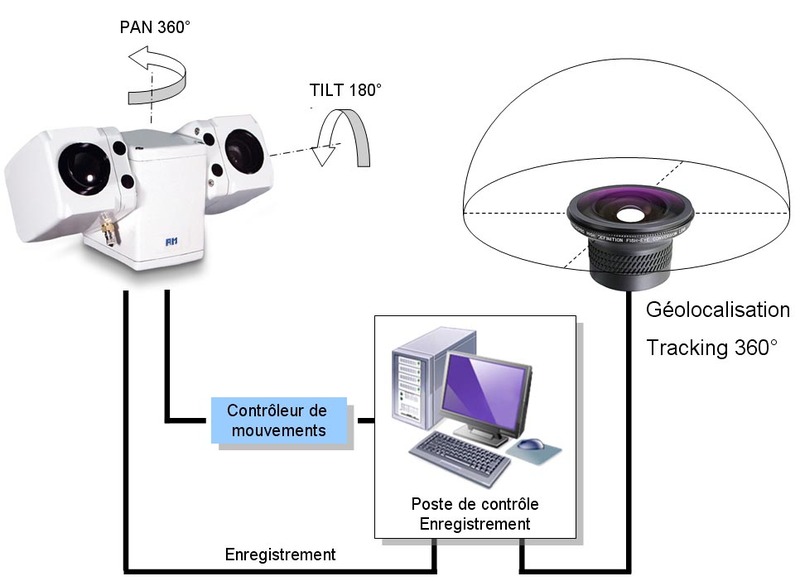 If two UFO-catch detection stations are operated together, separated a certain distance one from the other, the system allows a complete survey of the object’s trajectory in 3D and a velocity estimate. If the source comes into contact with the ground, the recording indicates the point of contact. Let´s also note that this tracking system would offer a great deal of services to astronomers in their search of meteorites. The UFO-science association cannot alone operate a system with a large number of UFO-catch detection stations. It thus searches for industrial partners, other associates or philanthropies in order to develop such a network. In 1981, Professor Michel Bounias, a biologist from the Istitut National d’Agronomie d’Avignon, was requested to carry out the analysis of the traces of a UFO landing in order to corroborate the observation made by a witness, together with a mechanic footprint that subsisted on the ground. The method employed consisted in a dosage of the pigmentary constitution of plants by means of thin-layer chromatography. This method is relatively simple and easy to replicate. 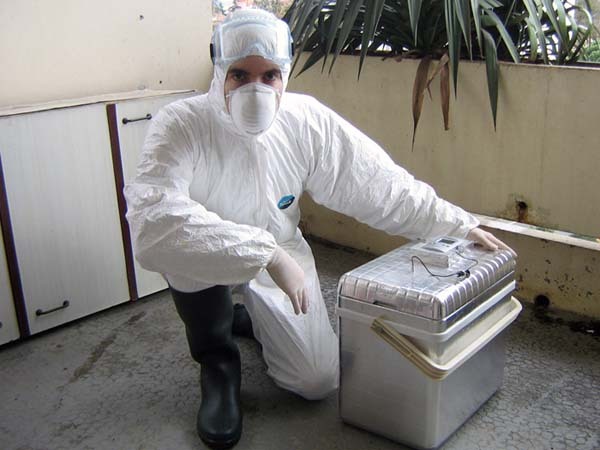 Dress for taking away samples and storage at low temperature in dry ice. By comparing the results with the densitometry profile the plant sample (its chromatographic “signature”) it is possible to discover eventual alterations, quantify them and correlate the phenomenon with the distance to the epicenter of the phenomenon. This was already made by professor Michel Bounias, deceased in 2003, when investigating the traces of the well-known case of Trans en Provence (France) in 1981 that revealed a correlation alteration for pigment vs. distance of 0.98. Professor Michel Bounias in 1984. The reconstruction of this technique was done during 2008 within the framework of the activities of the UFO-Science association, but it was soon realized that in the case of a new landing it would be impossible to keep working an analysis infrastructure with its own funds. This being, it is evident that the analysis of ground traces must be a part of the study of the UFO phenomenon, with biological analysis constituting a step in a panoply of examinations and tests rather broad. - Is it possible to move an object in air at a supersonic speed without creating a bang or shockwaves (and their associated wake turbulence)? In 1976 two members of the association (J.P. Petit and M. Viton) showed with hydraulic experiments that when a Laplace force field enters the scene it is possible to annihilate wake turbulence downstream of a cylindrical object. Since that time the first theoretical works, based on a reformulation of the theory of characteristics (“Mach waves”) in the presence of a Laplace force field showed that in effect this field could prevent these waves from being formed. Those who know fluid mechanics are aware that in a supersonic regime a flow can be associated with a system of Mach waves who carry pressure perturbations. It is the crossing of the waves that creates the shockwaves. Calculation of the distribution of “characteristics” (Mach waves) in a supersonic regime around a lenticular profile. Their accumulation indicates places of shockwave generation. Hereafter a schematic representation of the (two-dimensional) air flow around a lenticular profile, and the emergence of two shockwave systems: at the frontal edge and in the rear edge of the profile. Between these waves the (characteristic) Mach waves. 2D-supersonic flow around a lenticular profile, together with its two shock wave systems. Between these plane waves, plans represent the first family of Mach waves. Figure taken from the doctoral thesis of Bertrand Lebrun. A Laplace force field J x B prevents characteristics from crossing. - “MHD controlled” fluid mechanics, in which shockwaves are eliminated, the MHD opposing their formation. It is absolutely amazing that such research, without known precedents, published on refereed journals (see below) and presented in international specialized workshops (Moscow 1983, Tsukuba 1987, Pekin 1991), far from being encouraged and acclaimed, instead of being facilitated and sponsored was on the contrary opposed and even completely stopped in France at the end of the eighties. It was not necessarily the consequence, at least in France, of the action of an army anxious to develop that technology in secrecy with the aim of obtaining a hypersonic cruise missile (which hasn´t been done), but the desire of keeping “things under control”. We’ll finish this brief notice by adding that the “MHD discoid aerodynes” problematic is still alive and productive, and has presented recent communications in two international scientific workshops (2008 and 2009) as well as three papers in a top-level refereed journal. These problems have led to true discoveries in non-equilibrium plasma physics (magnetic parietal confinement technique by inversion of the magnetic gradient field). These researches, which lie at the top of the specialty (MHD and non-equilibrium plasma physics), will be continued with scandalously ridiculous funding. The hypothesis of extraterrestrial incursions poses immediately the thorny question of how to travel the considerable distances that separate us from the nearest stars, distances that are ten thousand times greater than the size of our solar system. Instead of contradicting the consequences of Special Relativity with its fundamental limitation of velocities with respect to light velocity, consequences that correspond to a geometrical requirement (in classic SR trying to go faster than light is equivalent to try to descend more deeply in a sphere than… its center), it is worth to consider the principles of SR in a wider context. The UFO-Science researchers have reprised and extended the works of Andrei Sakharov. A considerable amount of work has been done in the last 35 years, together with scientific publications in top-level journals and presentations in international workshops. The whole has been called upon the name of “twin-universe theory” by taking again the term introduced by the Soviet academician. Today it has been reformulated under the name of “bi-metric”, which is a universe where in order to go from a point A to a point B there can exist two ways corresponding to opposite times. Here once again the UFO phenomenon imposes itself with a powerful and stimulating scientific mood as a source of new ideas in a time when astrophysics and cosmology undergo a serious crisis and do not accept to exploit for their own benefit this paradigmatic knowledge. To be complete, another source of information in the form of letters signed by persons who claimed to be extraterrestrials should be quoted, the so-called Ummo affair. It is a very controversial and polemical issue, and many people intend to deny the scientific quality of the scientific knowledge contained in those letters. We will not develop that further here and mention only that in those texts appeared for the first time, in 1967, the idea that the velocity of light may have varied during cosmic evolution, idea that was reprised and developed by Jean-Pierre Petit in 1988-1989, see (8), (9), (10), (11), (14), (15). The above evocations show that the scientific world should bring interest into the UFO dossier, and that the scientific clues contained therein are numerous, real and revolutionary for the fields of fluid mechanics, cosmology and mathematical physics. Continuing on these grounds is the aim of the UFO-Science association. Time has come to get this dossier out from the ghetto of parasciences and from the folklore and put it among the great scientific problems of our time. (2) J.P. Petit (16–20 September, 1974). "Proceedings" in International meeting on spiral glaxies dynamics. Institut des Hautes Études Scientifiques (IHES), Bures-sur-Yvette, France. (3) J.P.Petit : "Is supersonic flight possible ?" Eigth Inter. Conf. on MHD Electr. Power Generation. Moscow 1983. (7) B.Lebrun : "Approche théorique de la suppression des ondes de choc se formant autour d'un obstacle effilé placé dans un écoulement d'argon ionisé. Thèse d'Energétique n° 233. Université de Poitiers, France, 1990. (8) B.Lebrun & J.P.Petit : "Theoretical analysis of shock wave anihilation by lorentz force field". International MHD symposium, Pékin 1990. (9) Convertisseurs MHD d'un genre nouveau (Comptes Rendus de l'Académie des Sciences de Paris, 15 Septembre 1975, t. 281, pp. 157-159) traduit New MHD converters. (10) Convertisseurs MHD d'un genre nouveau. Appareil à induction avec Maurice Viton (Comptes Rendus de l'Académie des Sciences de Paris, 28 Février 1977, t. 284, pp. 167-179) traduit New MHD converters : induction machines. (12) Univers en interaction avec leur image dans le miroir du temps (Comptes Rendus de l'Académie des Sciences de Paris, 6 Juin 1977, Série A., t. 284, pp. 1413-1416) traduit Univers interacting with their opposite time arrow. (13) A.D. Sakharov (1982). "Collected Scientific Works" (tr. D. Ter Haar, D. V. Chudnovsky et al.). Marcel Dekker, NY. ISBN 0824717147. (14) A.D. Sakharov (1984). "Œuvres scientifiques" (in French, tr. L. Michel, L.A. Rioual). Anthropos (Economica), Paris. ISBN 2715710909. (15) A.D. Sakharov (1967). "CP violation and baryonic asymmetry of the Universe". ZhETF Pis'ma 5 (Tr. JETP Lett. 5, 24–27) (5): 32–35. (16) A.D. Sakharov (1970). "A multisheet Cosmological model". preprint. Moscow, Russia: Institute of Applied Mathematics. (17) A.D. Sakharov (1972). "Topological structure of elementary particles and CPT asymmetry". Problems in theoretical physics, dedicated to the memory of I.E. Tamm. Nauka, Moscow, Russia. (18) A.D. Sakharov (1980). "Cosmological model of the Universe with a time vector inversion". ZhETF (Tr. JETP 52, 349-351) (79): 689–693. (19) Hydraulic simulation of shock wave annihilation & Annihilation of the Velikhov instability by magnetic confinment, Spiral electric currents with high appearent Hall parameter confinment (8ème Congrès International de MHD, Moscou 1983). (20) J.P. Petit (1988). An interpretation of cosmological model with variable light velocity. Modern Physics Letters A, 3 (16): 1527. (21) J.P.Petit : An interpretation of cosmological model with variable light velocity : the interpretation of red shifts (Modern Physics Letters A. Vol 3, N°18, Décembre 1988, pp 1733-1744). (22) J.P.Petit : Gauge cosmological model with variable light velocity. III: Comparison with QSO observationnal data (Modern Physics Letters A. Vol 4, N°23, Décembre 1989, pp 2201-2210). (23) Shock wave cancellation by Lorentz Force field avec B. Lebrun (10ème Congrès International de MHD, Pékin 1991). (26) J.P. Petit (1995). Twin Universes Cosmology. Astrophysics and Space Science (226): 273–307. (27) P. Midy; J.P. Petit (June 1989). Scale invariant cosmology. The International Journal of Modern Physics D, 8: 271–280. (29) : J.P. Petit; P. Midy, F. Landsheat (June 2001). Twin matter against dark matter in International Meeting on Atrophysics and Cosmology. "Where is the matter? ", Marseille, France. (33) : J.P. Petit; G. d'Agostini (August 2007). "Bigravity: Bimetric model of the universe. Very large structure". Colloque International sur les Techniques Variationnelles CITV, tr. International Meeting on Variational Techniques. (34) : J.P. Petit; G. d'Agostini (August 2007). "Bigravity: Bimetric model of the universe. Joint gravitational instabilities". Colloque International sur les Techniques Variationnelles CITV, tr. International Meeting on Variational Techniques. (35) : J.P. Petit; G. d'Agostini (August 2007). "Bigravity: spiral structure". Colloque International sur les Techniques Variationnelles CITV, tr. International Meeting on Variational Techniques. (36 ) : J.P. Petit; G. d'Agostini (12-15 September 2008). Bigravity Variable Constants Model (A bimetric model of the Universe. Interpretation of the cosmic acceleration. In early time a symmetry breaking goes with a variable speed of light era, explaining the homogeneity of the early Universe. The c(R) law is derived from a generalized gauge process evolution). 11th international conference on Physical Interpretations of Relativity Theory (PIRT XI), Imperial College, London. (38) J.P. Petit; J. Valensi, J.P. Caressa (24–30 July 1968). "Theoretical and experimental study in shock tube of non-equilibrium phenomena in a closed-cycle MHD generator" in International Symposium on MHD Electrical Power Generation. International Atomic Energy Agency, Warsaw, Poland. Proceedings 2: 745–750. (39) : J.P. Petit; J. Valensi, J.P. Caressa (24–30 July 1968). "Electrical characteristics of a converter using as a conversion fluid a binary mix of rare gases with non-equilibrium ionization" in International Symposium on MHD Electrical Power Generation. International Atomic Energy Agency, Warsaw, Poland. Proceedings 3. (40) : J.P. Petit; J. Valensi, D. Dufresne, J.P. Caressa (January 27, 1969). "Caractéristiques d'un généateur linéaire de Faraday utilisant un mélange binaire de gaz rares, avec ionisation hors d'équilibre" (tr. Characteristics of a Faraday linear generator using a binary mix of rare gases, with non-equilibrium ionization). CRAS 268 (A): 245–247. Paris: French Academy of Sciences. (41) J. Valensi; J.P. Petit 15 mars 1969). Etude théorique et expérimentale des phénomènes accompagnant la mise hors d'équilibre dans un générateur à cycle fermé (tr. "Theoretical and experimental study of phenomena accompanying the non-equilibrium stage in a closed-cycle generator"), Compte rendu 66-00-115, Institut de Mécanique des fluides, Université d'Aix-Marseille, France. (42) : J.P. Petit; J. Valensi (April 14, 1969). "Performances théoriques d'un générateur de type Faraday avec ionisation hors d'équilibre" (tr. "Theoretical performances of a Faraday generator with non-equilibrium ionization"). CRAS 268 (A): 245–247. Paris: French Academy of Sciences. (45) : J.P. Petit; J. Valensi (September 1, 1969). "Growth rate of electrothermal instability and critical Hall parameter in closed-cycle MHD generators when the electron mobility is variable". CRAS 269: 365–367. Paris: French Academy of Sciences. (46) : B. Forestier; B. Fontaine, P. Bournot, P. Parraud (July 20, 1970). "Study of the variations in the aerodynamic flow parameters of ionized argon subjected to Laplacian accelerating forces". CRAS 271: 198–201. Paris: French Academy of Sciences. (47) : J.P. Petit (March 10, 1972). "Applications de la théorie cinétique des gaz à la physique des plasmas et à la dynamique des galaxies" (tr. "Applications of the kinetic theory of gases to plasma physics and galactic dynamics"). Doctor of Science thesis, CNRS#6717, University of Provence, Aix-Marseille, France. (48) : J.P. Petit; M. Larini (May 1974). "Transport phenomena in a nonequilibrium, partially ionized gas in a magnetic field". Journal of Engineering, Physics and Thermophysics 26 (5): 641–652. (49) : J.P Petit; J.S. Darrozes (April 1975). "Une nouvelle formulation des équations du mouvement d'un gaz ionisé dans un régime dominé par les collisions" (tr. "New formulation of the equations of motion of an ionized gas in collision dominated regime"), Journal de Mécanique 14 (4): 745–759, France. (50) : J.P. Petit (September 15, 1975). "Convertisseurs MHD d'un genre nouveau" (tr. "New MHD converters"). CRAS 281 (11): 157–160. Paris: French Academy of Sciences. (51) : J.P. Petit; M. Viton (February 28, 1977). "Convertisseurs MHD d'un genre nouveau. Appareils à induction" (tr. New MHD converters: induction machines"). CRAS 284: 167–179. Paris: French Academy of Sciences. 15 J.P. Petit (1979). "Prospects on magnetohydrodynamics". Technical Report CNRS on behalf of CNES. 16 J.P. Petit; M. Billiotte, M. Viton, (October 6, 1980). "Accélérateur à courants spiraux" (tr. "Magnetohydrodynamics: Spiral-current accelerators"). CRAS 291 (5): 129–131. Paris: French Academy of Sciences. (52) : J.P. Petit; M. Billiotte (May 4, 1981). "Méthode pour supprimer l'instabilité de Velikhov" (tr. "Method for eliminating the Velikhov instability"). CRAS 292 (II): 1115–1118. Paris: French Academy of Sciences. (53) : J.P. Petit (September 1983). "Cancellation of the Velikhov instability by magnetic confinment" in 8th International Conference on MHD Electrical Power Generation. Proceedings, Moscow, Russia. (55) : J.P. Petit (September 1983). "Spiral electric currents with high appearent Hall parameter confinment" in 8th International Conference on MHD Electrical Power Generation. Proceedings, Moscow, Russia. (54) : B. Lebrun [dir. J.P. Petit] (1987). "Approche théorique de la suppression des ondes de choc se formant autour d'un obstacle effilé placé dans un écoulement supersonique d'argon ionisé à l'aide de forces de Laplace" (tr. "Theoretical study of shock wave annihilation around a flat wing in hot supersonic argon flow with Lorentz forces". Engineer-Doctor thesis, Aix-Marseille University; & Journal of Mechanics, France. (55) : J.P. Petit; B. Lebrun (1989). "Shock wave annihilation by MHD action in supersonic flow. Quasi one dimensional steady analysis and thermal blockage". European Journal of Mechanics B/Fluids 8 (2): 163–178. (56) : J.P. Petit; B. Lebrun (1989). "Shock wave annihilation by MHD action in supersonic flows. Two-dimensional steady non-isentropic analysis. Anti-shock criterion, and shock tube simulations for isentropic flows". European Journal of Mechanics B/Fluids 8 (4): 307–326. (57) : J.P. Petit; B. Lebrun (October 1992). "Theoretical analysis of shock wave anihilation with MHD force field" in 11th International Conference on MHD Electrical Power Generation. Beijing, China. Proceedings III, Part.9- Fluid dynamics, art.4: 748–753. (58) : J.P. Petit; J. Geffray (22-26 September 2008). "MHD flow-control for hypersonic flight" in 2nd Euro-Asian Pulsed Power Conference (EAPPC2008), Vilnius, Lithuania; and in Acta Physica Polonica A 115 (6): 1149–11513 (June 2009). (59) : J.P. Petit; J. Geffray (22-26 September 2008). "Wall confinement technique by magnetic gradient inversion. Accelerators combining induction effect and pulsed ionization. Applications." in 2nd Euro-Asian Pulsed Power Conference (EAPPC2008), Vilnius, Lithuania; and in Acta Physica Polonica A 115 (6): 1162–1163 (June 2009). (60) : J.P. Petit; J. Geffray (22-26 September 2008). "Non equilibrium plasma instabilities" in 2nd Euro-Asian Pulsed Power Conference (EAPPC2008), Vilnius, Lithuania; and in Acta Physica Polonica A 115 (6): 1170–1173 (June 2009). (6) : J.P. Petit; J. Geffray, F. David (19-22 October 2009). "MHD Hypersonic Flow Control for Aerospace Applications", AIAA-2009-7348, in 16th AIAA/DLR/DGLR International Space Planes and Hypersonic Systems and Technologies Conference (HyTASP), Bremen, Germany.